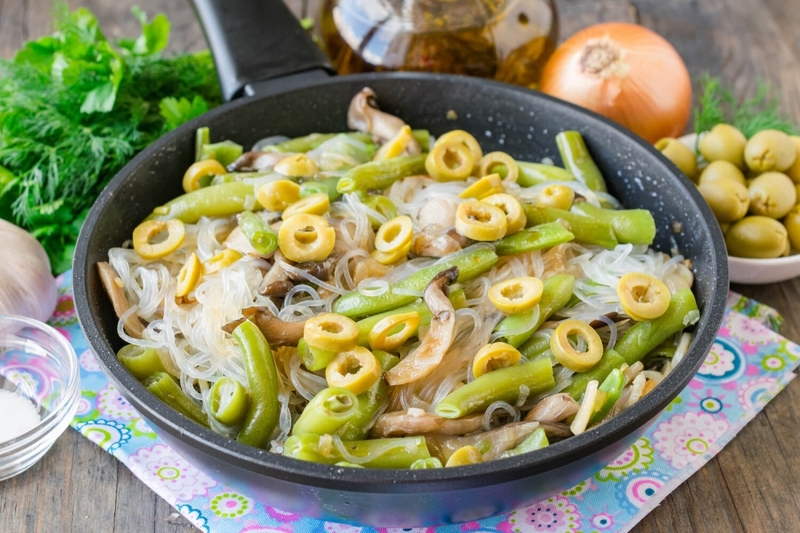 Tasty and bright rice noodles, oyster mushrooms and green beans salad will leave nobody indifferent. The recipe will be good for athletes, vegetarians or fasting. Salad is low-calorie, but at the same time very nourishing and healthy because of a large amount of proteins and useful minerals in it. 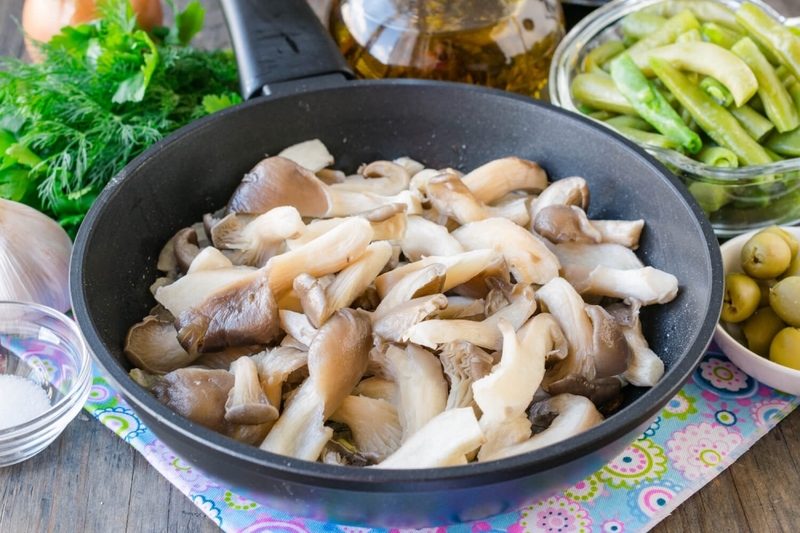 At a will it is possible to replace an oyster mushroom with champignons, the fresh or frozen forest mushrooms. 1. Peel and cut into quarter rings onions. 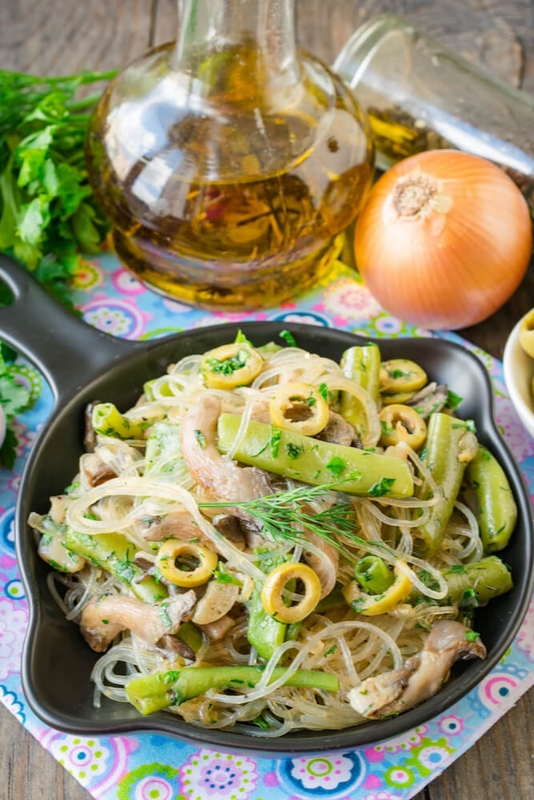 Peel and cut into thin slices garlic сloves. 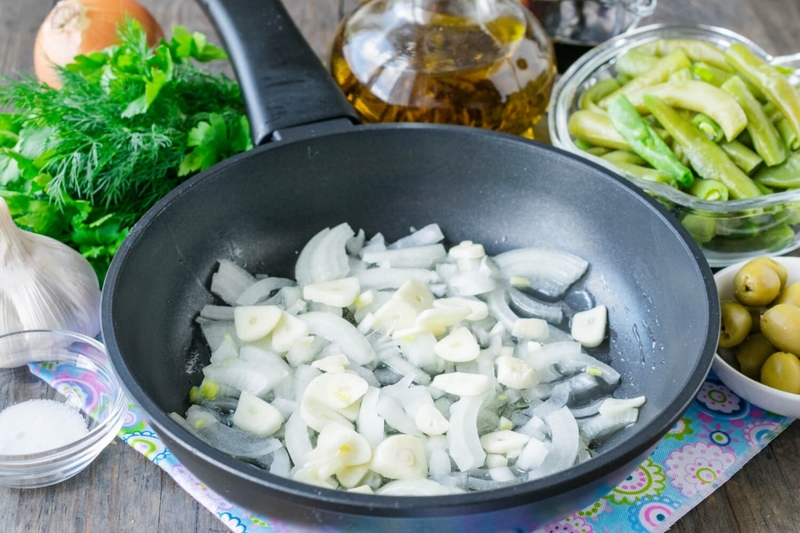 Lay out the cut vegetables on the heated with olive oil frying pan. Stirring slowly, fry onions with garlic to a light golden brown. 2. Wash oyster mushrooms and cut off the rough basis. 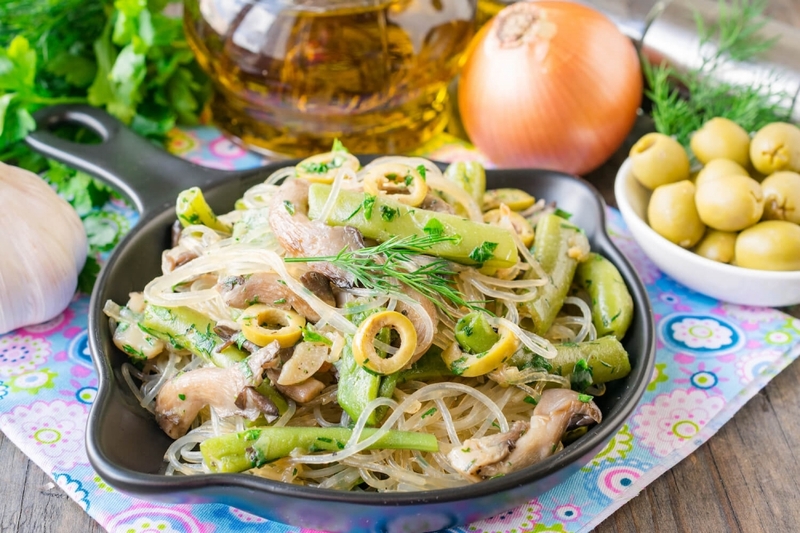 Cut mushrooms on large pieces. When onions and garlic are reddened, add fresh oyster mushrooms to them. Stirring slowly from time to time, fry ingredients until all liquid evaporates from a frying pan. 3. 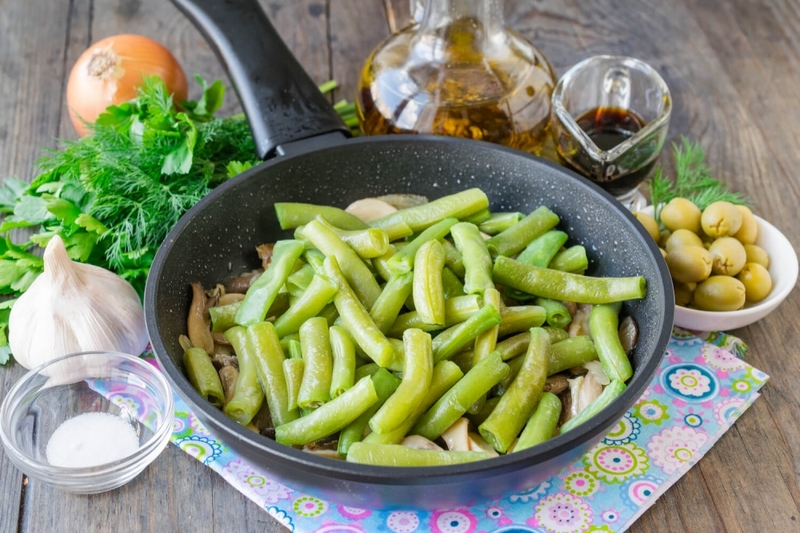 Then add green beans on a frying pan. If you use the frozen products, you don’t need to defreeze it previously. Stirring slowly, continue to prepare ingredients together on middle fire for 5 minutes more. 4. Put rice noodles in the boiling salted water and boil thoroughly for 1 minute then cast away on a colander. 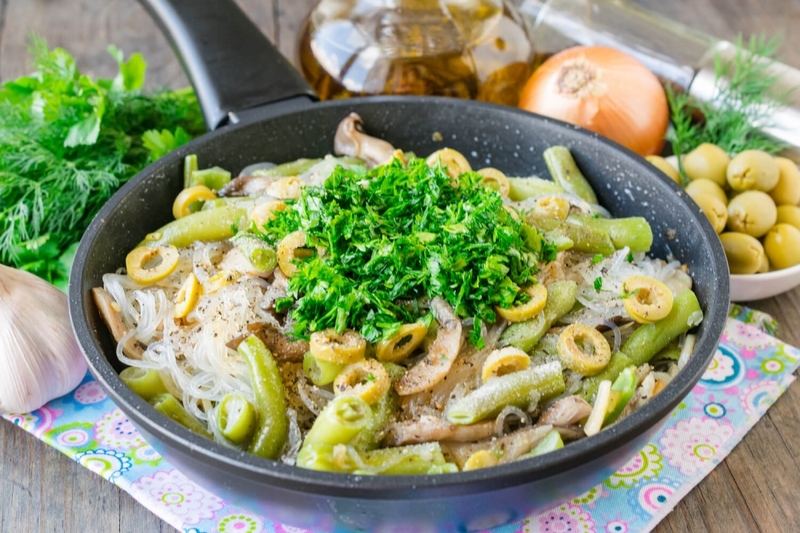 Add rice noodles to other ingredients and mix. 5. Add to salad the green olives cut into rings. Pour in soy sauce. 6. For taste and aroma add small cut greenery of dill and parsley. Accurately mix salad. 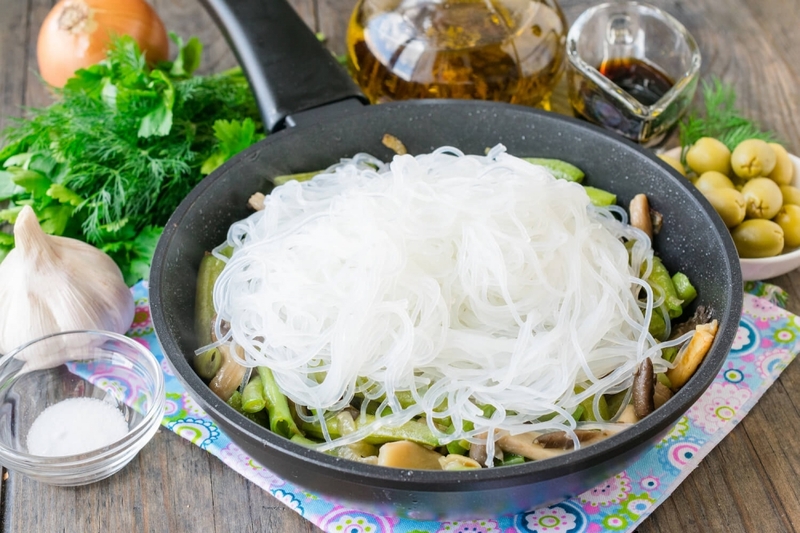 Warm up rice noodles salad on low fire for 1-2 minutes more then start serving a dish. 7. 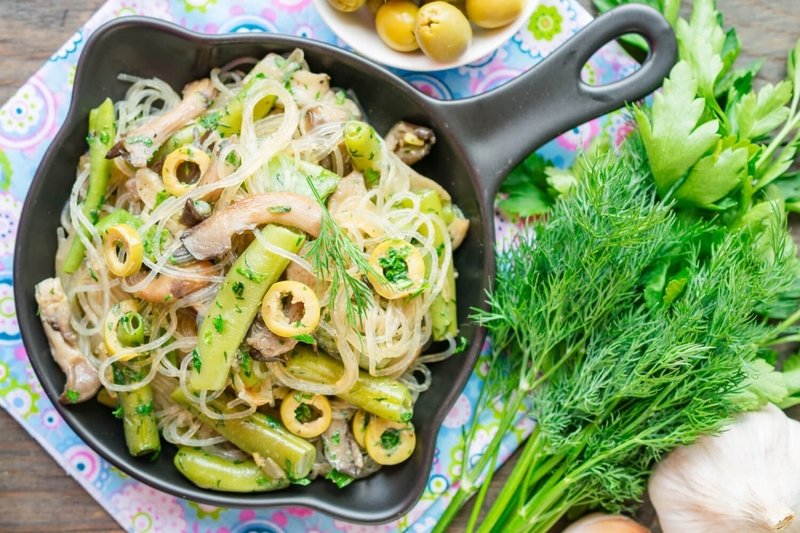 Ready-made rice noodles salad can be served warm right after preparation or previously cooled in the refrigerator.